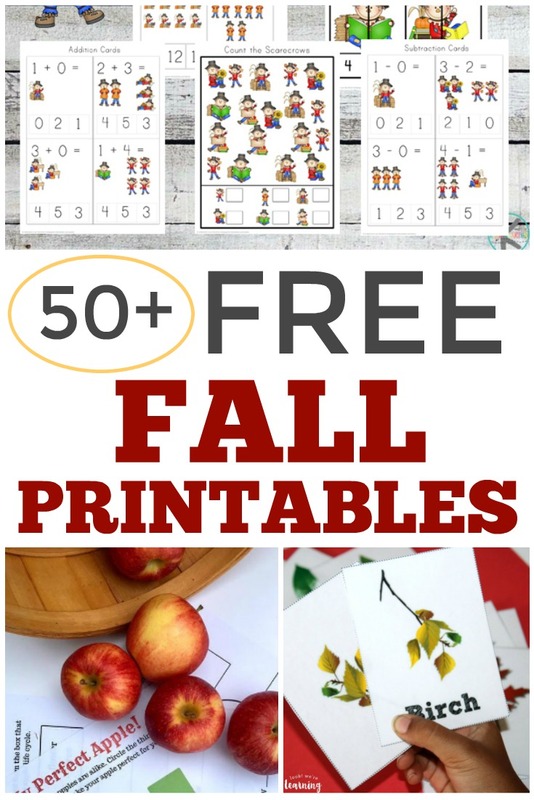 Over 50 Free Fall Printables for Kids - Look! We're Learning! It’s the middle of September and we’re nearing my favorite time of the year: fall! Which gave me a perfect excuse to share some of my favorite free fall printables for kids! We’ll be using several fall themes for unit studies with our kids in the upcoming weeks, including leaves, farms, harvest, and apples. 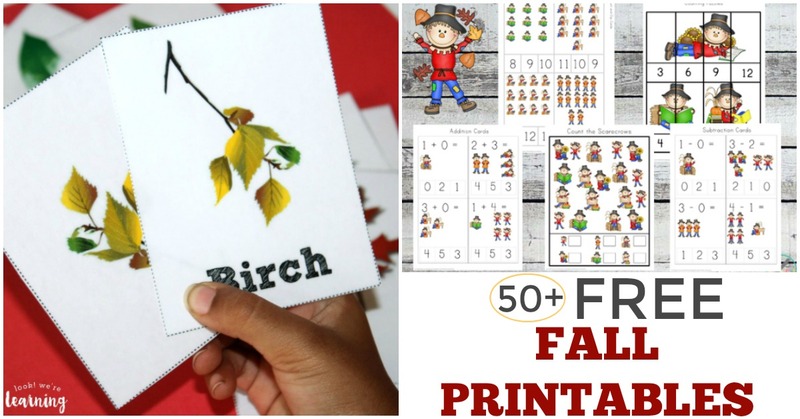 If you’d like to learn about autumn with your children, you might like to look through the list of over 50 free fall learning printables for kids below! By the way, if you’re ready to stock up on printables for other seasons of the year, don’t miss our roundups of free spring printables for kids, free summer printables for kids, and free winter printables for kids! 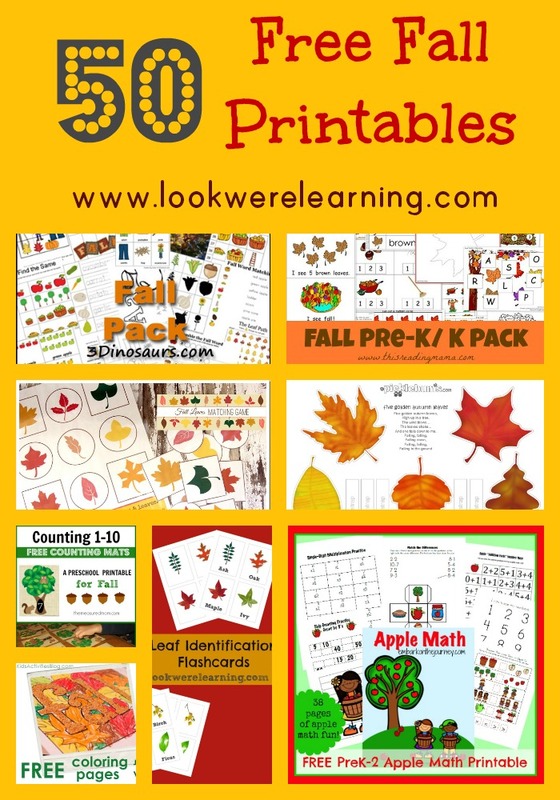 In the following list, you’ll find all kinds of fall printables for kids, including autumn printables, math worksheets, apple activities, scarecrow printables, lapbooks, and more! If you get a chance to try some of them this year, I’d love to know which ones your children loved the most! Farm Do-A-Dot Shape Mats – Look! We’re Learning! Apple Harvest Scissor Skills Printables – Look! We’re Learning! Thanks so much for sharing this great resource! Fall is HERE, and I’m always looking for ways to supplement what my daughter is learning in school! What an extensive list! We’ll be using some of these for sure. Pinning to my fall activities board! This a great list! Thanks for putting it together and sharing! 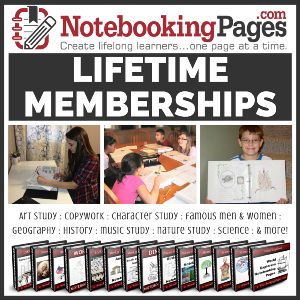 Thanks for including my leaf copywork pages! I’m going to check out the other links and hopefully find something to use at a preschool homeschool group I’m going to on Friday =) Thanks! Thank you so much for including one of my posts! I REALLY appreciate it! Such a great list! I am thankful that I came across this site. I have been looking for some fun apple pages. I am amazed at how many pages your My Apple Pie Tree Lap book has in it. Adorable and have already used them with a group of children. They loved it. Thanks so much for this! I love having a go-to for days when my toddler just “needs” some extra work to do! These look like some wonderful printables for the kids. I’m always looking for activities to keep the kids entertained as the weather gets cooler (still not sure where summer went?!) and these will give us some great fun and educational options. Thank you for taking the time to pull this together and share with everyone.